GWP Architecture has now obtained planning permission for our Causewayside student accommodation scheme. 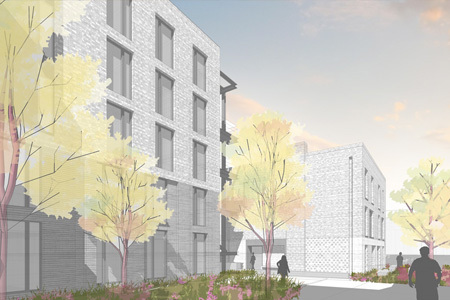 Edinburgh City Council approved the scheme for Melford Developments Ltd at the recent committee meeting. The 152 bedroom scheme which is targeting BREEAM ‘Outstanding’ follows on from the successful completion of Champion Hill Residences at King’s College London and Birley Fields at Manchester Metropolitan University. Which have each achieved this industry-leading standard, putting them in the top 1% of sustainable buildings in the UK. The accommodation is provided in 107 studio rooms and 45 townhouse bedrooms divided among five, nine bed townhouse units. The Townhouses are designed to create a sustainable living environment based on the family home. Each townhouse has a shared kitchen, dining and living room on the ground floor with bedrooms and shared WC/shower rooms on the ground and upper floors. Each studio unit is self-contained with it’s own fully equipped compact kitchenette, en-suite WC/shower room, bed and study area. The ground floor lobby entrance provides access from Causewayside and contains a student lounge, quiet study area, seminar room, reception, FM office and access to the laundry. The scheme will utilise highly sustainable building practices including off site manufactured en-suite ‘pods’ and structural frame, the townhouse units will each have green roofs, improving local biodiversity, while also reducing rain water runoff. Construction of the accommodation is scheduled to start in June and completion is planned for June 2016. For further project information head to the project page.